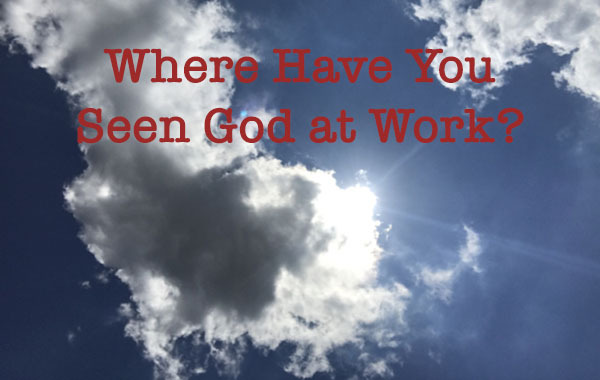 Where have you seen God's work lately? We recently found out how God uses something we say or do in very unique ways. At our Meet N Greet in June, on Dorothy van Hove's recommendation, we had as our guest speaker Cheryl Cooper who works with Random Acts of Flowers. Her talk touched many of us deeply. Random Acts of Flowers accepts donations of flowers that might otherwise be thrown away and makes them into new creations of beauty and takes them to hospitals or health care facilities, often giving them to patients who may not have visitors or receive any flowers. Kathy Clark, a Congregational Life Committee member who works for the Indiana Historical Society, realized that there were a lot of used vases in storage at the museum that Random Acts of Flowers would be able to use. Kathy and Tom Borman, director of events and donor relations at the Indiana Historical Society, rounded up the vases, of which there were many, and delivered them to Random Acts. As a result of this connection, florists who volunteer for Random Acts are going to help with the flower arrangements for a very large gala that the museum is having this weekend as a fund raiser. The Historical Society of Indiana will then donate the flowers back to Random Acts following the gala. Furthermore, starting in mid-November and going until January, the museum has a Christmas tree display that also is a fundraiser. Groups purchase a tree and decorate it. Random Acts will decorate a tree and their name and story will be put near the tree for all who attend to see what they do and hopefully join in these random acts with their unused flowers. No question we are seeing God at work here.